The Scottsdale climate is a difficult one for foliage as well as building materials. 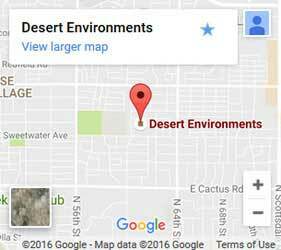 Desert Environments offers thoughtful landscape designs that focus on its ability to thrive in the desert heat. Call now for landscaping that blends in seamlessly with the natural surroundings and the neighborhood. Mike Kiesler, local owner-operator, has served the Scottsdale area for over 25 years, participating in every position having to do with landscaping. For Mike, taking personal responsibility for all aspects of his landscape installations means overseeing the entire process, from beginning to end. He works closely with property owners to plan a custom design to fit their vision and functional needs. Once a plan is created, he manages the entire construction process, ensuring quality down to the smallest detail. 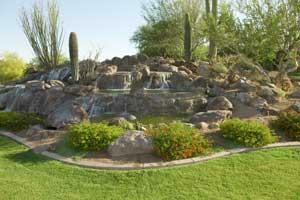 Desert Landscaping offers some of the best warranties available. Customer satisfaction is central in all our projects. We work one-on-one with customers, keeping an open dialog throughout the planning and installation process. We ensure the design is exactly what the customer wants. We utilize the highest quality products and best practices to ensure a superior, lasting end result. If anything is not to your liking, just let us know. We will make it right. We want you to love your outdoor spaces. Whether you install an outdoor kitchen, a relaxing meditation space with a water feature, or simply increase the beauty and curb appeal of your yard, we deliver landscaping you will enjoy for years to come. 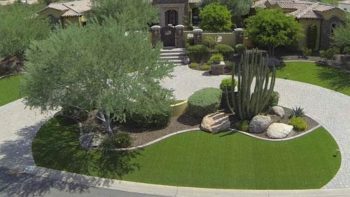 Call for quality landscape design and installation in Scottsdale and the Greater East Valley area.